We have been busy with planting, weeding and harvesting at the Urban Farm. With the help of some dedicated volunteers, we have already donated over 1500 pounds of lettuce! Staff and volunteers have also been busy harvesting broccoli, collard greens, kohlrabi, bok choy, peas and more! This week we planted peppers, tomatoes, potatoes, sweet potatoes, and okra. We're looking forward to donating more fresh produce this summer! We were excited for our first 30 pounds of broccoli sent to the Food Bank's Central Pantry! This crop's a labor of love, and the payoff is a super nutrient-dense, fresh as it gets veggie! Broccoli is one of the healthiest vegetables around! It has a high content of soluble fiber, is high in vitamin C, vitamin K, calcium, potassium, and magnesium. Take a look at some photos from the Urban Farm, as we labor through this heat to make these harvests happen! Georvaeh French dices a freshly-washed tomato Monday at Columbia Square and Claudell Homes. This was the first time French cut a tomato. Frenchâ€™s tomato slices added to a mix, with the end goal of making salsa. Lori McCurdy, outdoor classroom network manager for the Columbia Center for Urban Agriculture, explains the parts of a plant to first-grade student Maryah Hannah on Monday at Columbia Square and Claudell Homes. Hannah helped plant tomato plants in two planting pots with the rest of her classmates. The students will water and watch the plants grow until the tomatoes are fully grown at the end of the summer. First-grade student Maryah Hannah and teacher Natalee Thornton wash tomatoes provided by the Columbia Center for Urban Agriculture on Monday at Columbia Square and Claudell Homes. Columbia Center for Urban Agriculture will be visiting Thorntonâ€™s classroom for three more sessions where students will continue to learn about how food is processed and grown. 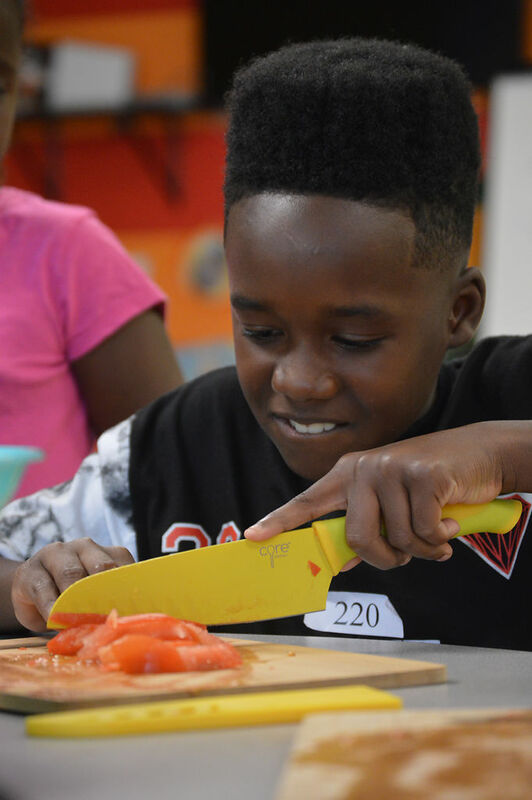 Columbia Public Schools and the Columbia Center for Urban Agriculture have teamed to create a new farm-to-school coordinator position to help encourage third- to fifth-grade students to eat more fruits and vegetables. The goals of the farm-to-school coordinator are to increase fruits and vegetables on a studentâ€™s plate, improve behavior and academics and promote healthy lifestyle choices, said Laina Fullum, the school districtâ€™s director of nutrition services. Fullum said a person had been selected for the position but that an employment agreement had not been finalized and that an announcement likely wouldnâ€™t be made until July. Students will have the opportunity to grow fruits and vegetables in school gardens with the help of the coordinator. Fullum said that if students are involved in growing the fruits and vegetables they see at lunch, they are more likely to choose them and make healthier choices as they get older. â€œThey are more invested in fruits and vegetables when they have that hands-on experience,â€ she said. The Columbia Center for Urban Agriculture will provide about $42,000 for the farm-to-school coordinator position, which also receives funding from Boone County Childrenâ€™s Services. This funding can be renewed for up to two years. The school district will pitch in about $32,000, said Billy Polansky, the centerâ€™s executive director. The person will work with teachers and the center to organize field trips to the urban farm, write curriculum and plan interactive activities for students. Fullum also said getting to work in the gardens will help them make connections between what is happening in the garden and what they are learning in class. When students can move around and learn in the school garden, it will help them be calmer and focused in the classroom. Students who do not eat enough fruits, vegetables and dairy products tend to have lower grades, according to research by the Center for Disease Control and Prevention. The farm-to-school coordinator will allow the center to better serve students. 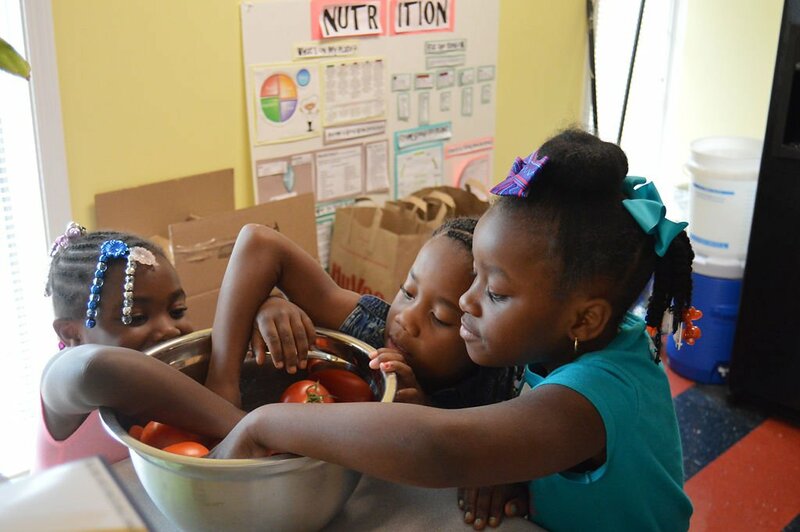 The farm-to-school coordinator will work with approximately 1,000 students at Alpha Hart, Elliot Battle, Benton STEM, Blue Ridge, Derby Ridge, New Haven, West Boulevard and Parkade elementary schools. The schools were chosen to be the first participants in the program because more than half of students at these schools participate in the free and reduced lunch program. Fullum said students from low-income households are less likely to be exposed to fruits and vegetables. She said she believed the program will help students develop an appreciation for them. Some of the program funding came from Boone County Childrenâ€™s Services, which is part of Boone County Community Services. Kelly Wallis, community servicesâ€™ director, said the county decided to help fund the program because it provides hands-on experience. Also, Heart of Missouri United Way is providing a one-time grant of about $18,000 to build six new school gardens and roughly $14,000 that can be renewed for up to three years, said Rachel Delcau, the agencyâ€™s director of community impact. â€œWe had a lot of advisory council members believe in the ability of Columbia Center for Urban Agriculture to make an educational impact in our community,â€ she said. Fullum said that their long-term goal is to expand this program to all schools in the district. â€œWe hope the stats from the eight schools are encouraging enough for us to keep moving forward in that particular direction,â€ she said. Supervising editors are Katherine Reed and Sky Chadde.